3 How to use the Time Loop Layer ? 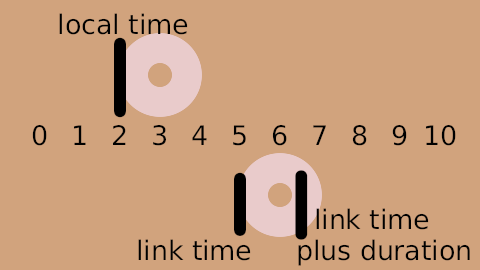 The "Time Loop layer" is used to repeat an animation over and over. It loops a section of the layers below and within the same canvas over and over. See also the Time Loop ValueNode conversion, which can be used to loop the value of a single parameter, rather than an entire layer or group of layers. These parameters, to prevent undesired modification, by default are statics. Start time of cycled material/child layers. Number of seconds or frames that are looped in the child layer. If checked and "Duration" is zero or negative, then the time loop layer is effectively disabled, and acts as if it wasn't there. 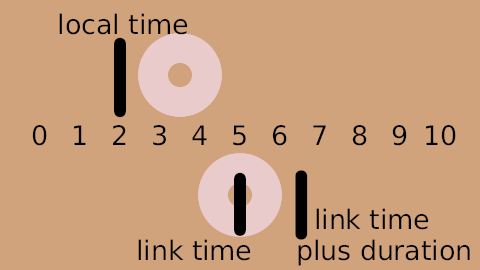 If not checked and the Duration is zero, the Time Loop layer freezes the animation of the children layers at the value of "Link Time". If not checked, and the current time is less than "Local Time", then "Duration" is taken off the resulting time. This is to provide compatibility with version 0.1 of the time loop layer. How to use the Time Loop Layer ? 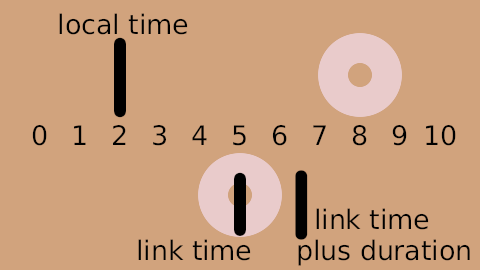 The "Time Loop layer" repeatedly loops through the "Duration" seconds of its child layers, from "Link Time" to "Link Time" + "Duration". "Local Time" is used to line up the offset of the time looping. 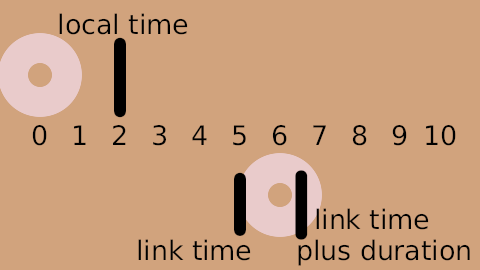 When the Time Loop layer is asked to set its time to "Local Time", it sets the time in its child layers to be "Link Time", ie. the start of the loop. In the layer's parameters of the time loop, you need to remove the 'green guy' ( ), indicating that the parameter is "Static", from Duration Parameter. Just right-click on him and set "Allow animation". See Static Parameters for more informations. On the timeline navigate to a place where you want to break the animation. And now enter the Animation Mode. In the time loop parameters, set 'Duration' to "EOT" (End-of-Time). Now you have three waypoints. One before the current, we left it as it is. One is current, we convert it to the "constant" (right-click on it -> Both -> Constant). And one after current, this one have to be removed (right-click on it -> Remove). Now test it. Pay attention, that loop will always break at the very first frame of you animation, so you need to break it in the right place. 'Green guy' ( ) - Static Parameters - is a guard that says "You shall not pass!" to the animation. So when you attempt to change such parameter in animation mode it just changes the usual way. It's done to prevent unnecessary parameters to be animated, e.g. Blend Method. Removing waypoint after current one. If you skip this step, then at the next waypoint "Duration" parameter will be restored to the value before current waypoint. It's a standard Synfig's behavior, but there's a magical button somewhere that can change it. Converting current waypoint to the constant. Without it, "Duration" will be smoothly interpolated from value you set to the EOT and the constant type will just set immediately at the waypoint. Interpolation can be a bit confusing sometimes, so you better read this about waypoints. And suppose that the Time Loop layer is applied over an existing animation. The "Link Time" and "Duration" specify that the section from 5s to 8s in the children layers will be looped. The "Local Time" specifies that this loop will be at the beginning at 4s. (And so also therefore at 1s, 7s, 10s, etc). Specifying a huge number for the Duration parameter effectively turns the Time Loop layer into a Time Shift layer. 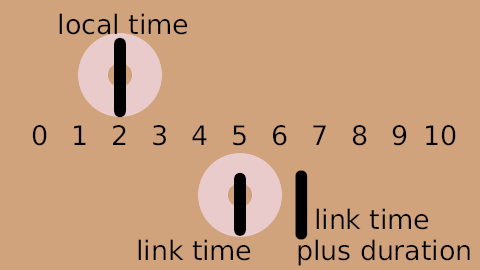 The Link Time and Local Time parameters controls which time in the children lines up with which time in the Time Loop layer, giving the amount of the timeshift, with both positive and negative differences working as expected. It's a 10 second animation, and shows 2 circles. The top one moves linearly from the left to the right. Its position is marked by static text digits 0 through 10. There's a rendered copy of this example on YouTube, and it's also available for download: Time-loop-demo-0.2.avi‎. This page was last modified on 26 February 2017, at 06:59.